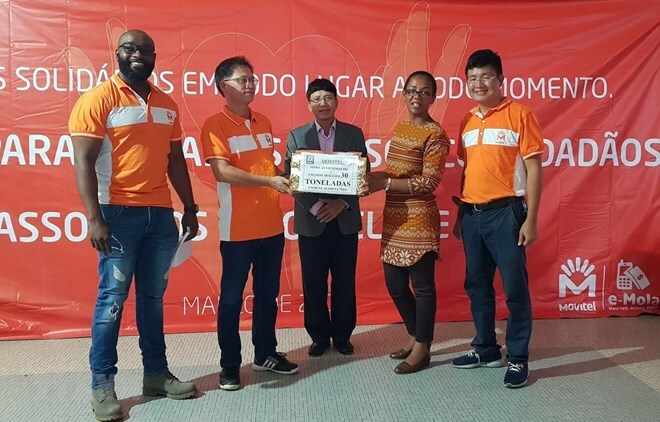 Hanoi (VNA) – Movitel, the joint-venture between Vietnam’s military-run telecom provider Viettel and Mozambique’s SPI Invespar company, handed over 50 tonnes of relief food on March 26 to support residents in the central province of Sofala’s Beira city, who are suffering heavily from the aftermath of Tropical Cyclone Idai, which ripped through the African country in mid-March. Speaking at the hand-over ceremony, Director of the provincial Department of Industry and Trade Josefa Sing Sang thanked Movitel for the humanitarian relief goods, saying that this shows the valuable support of the firm as well as the Vietnamese Government and people, contributing to helping local people overcome difficulties and severe consequences of the storm. The official said authorities and the people of Beira city appreciate Movitel’s efforts in quickly handling technical incidents after the storm, becoming the only telecom operator to complete troubleshooting and ensure smooth communication back to central provinces of Mozambique. For his part, Vietnamese Ambassador to Mozambique Le Huy Hoang emphasised that the relief goods of Movitel and the company’s activities to actively settle consequences of the storm show the determination of Movitel, and the Viettel Group in general, in joining hands to support local people in overcoming difficulties and continuously developing. According to Vice General Director of Movitel Nguyen Ngoc Nam, the company has recovered more than 80 percent of its base transceiver stations, with the repair work on those remaining in remote and flooded areas expected to be fully completed by the end of this month. Tropical typhoon Idai is considered the biggest natural disaster in the last 30 years, severely destroying the central region of Mozambique and the neighboring countries of Zimbabwe and Malawi. The storm has killed at least 468 people and injured over 1,500 others in Mozambique, with most houses and offices in the port city of Beira completely destroyed.